One way in which Fresh Expressions of church are springing into life is through 'new monastic' or 'intentional' communities, groups of individuals and families living in the same geographic area or connected virtually who share a simple rule of life. 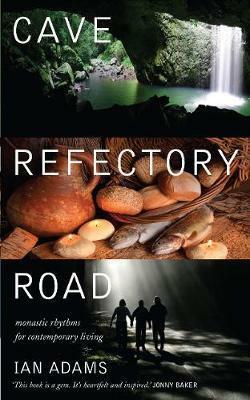 Cave ~ Refectory ~ Road explores how traditional monastic life is helping to shape a new flowering of Christian community today. It traces the roots of 'new monasticism' and draws on the classic elements of monastic life to suggest how this ancient wisdom, learning and spiritual practice might be reinterpreted for new settings. A handbook for all who are exploring 'intentional living', its rich and inspiring teaching is clustered around these themes: The cave: the place of stillness, prayer and withdrawal that can inspire a new engagement with the mystery of God,the refectory: how monastic practices of hospitality can create communities that make a difference in the world and the road: how the example of the friars can lead to creative and loving engagement with public life. IAN ADAMS is an Anglican priest, an Associate Minister with Fresh Expressions, a missioner with the Church Mission Society and founder of mayBe, a new monastic community in Oxford. A popular Greenbelt speaker, he is the creator of Morning Bell, a daily call to prayer sent by e-mail, text and twitter. He lives in South Devon.